The thing with this “surprise engagement” was that CBS announced the surprise on Thursday night. Jeff and Jordan went ring shopping a few months ago and Jordan gave him a deadline in September! They also have to deal with photos from their engagement that have Frankie in them. For that, I feel bad for them! 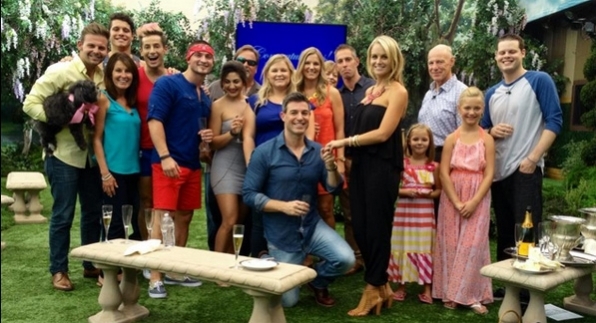 Either way, it took a few years, but Big Brother 16 is where Jeff finally popped the question. Seeing the old photos and videos was cute and did bring a tear to my eye. Love is love and they seem so happy together and they do make a very cute couple, so good for them! Yeah, i have to admit it was romantic and cute. It really doesn’t matter whether i like them or not. I still wish them well and a long and happy marriage. I especially liked the song they sung, it brought a tear to my eye. The words were perfect for those two. I have to agree. And the video of their time in the house made me think of how BB used to be more exciting. A nostalgic little trip for me into BB past. It sure was Cat and I hope so much they can “rewind” it and bring back the good old days. It truly worked! I agree Cat, I was thinking the same thing. It really makes you long for the days of BB past when players were there to play the game! It was wonderful to see the videos and remember some of the “better days” of BB. Looking at the group photo, I was pleasantly surprised that Frankie was not making “horns” over someone’s head–isn’t that what the silly little troublemakers always did in junior high whenever a photo was being snapped? Yes, Tessa and he acts like a troubled teenager and he is 31 year right, BB check his birth certificate are you sure he is the age he states. Have you seen the wrinkles and rough skin he has going on? He looks older than 31! No wonder he applies so much makeup! No I never noticed, but I will look next time he is on. I’m in my 40’s and I don’t have wrinkles like that! Must be a rough lifestyle he has going on…! I’ve noticed, especially on close-ups. He has said a couple of times on the feeds that he is 27. Yeah…RIGHT!! And i’m 19 going on 20! Come on now Cat…Even I have managed to up my age to 23…been that way for so long …that a few weeks ago my doctor asked me how old I was…I said what year is it. I agree. H.D. isn’t being to kind to old twinkle toes. He needs to lay off of the makeup and buy some moisturizer instead. Preferably the economy size. I’ll have to try and notice that but the only time I have really seen his face close up, he was putting on blush so apparently the foundation had already been trowelled on! Hahaha, Carrie, very funny! Frankie (and his hideous blue shorts) in their engagement photos! Honestly, having all five hgs involved seemed goofy to me. That must be why they didn’t let the five out there initially, only family. Those little boy shorts look like a pair Andy from last season left behind. I don’t know which one looks more disgusting in them. Yea, that’s a tough one Sissy, I can’t decide either. A tossup for sure! They both make me want to puke. And when Jordan and Jeff came in the house how he just flew down the stairs in his fairy shoes. That was so funny, Frankienstine ran down those stairs faster than a bolt of lightening hahaha! We think so much alike Carol, that was my exact wish as well! Now that would have given us all a good laugh , one that we all need. As long as he didn’t get (seriously) hurt. I don’t like to see anybody get badly hurt, maybe if he sprained a foot or something just enough so he’s real bad in comps. Then production would have to come up with a competition which wouldn’t require using his feet. I confess that if that had happened, I might still be laughing! He was in a hurry to tell the couple how fortunate they were to have such a talented media mogul at their engagement party. I kept thinking they were going to trip and fall carrying the cack outside. One of the few times this year I enjoyed Big Brother. Better love match than on The Bachelor!!!! Good luck to Jeff and Jordan. I didn’t bother watching last night because what on earth for? Nothing new was going to happen with the house guest. I recorded it as always but…not worth the time. I’ll watch Boardwalk empire. It HAS been downright awful this year and last but I have to watch next year and if, God help me, it’s not any better, I pray for the strength to stop. Anyone know of a good BB rehab I can join? HAHAHA after this year and last I think we all need it as we just keep on watching. I know how you feel…It is so bad, I even started watching the Blue Bombers…but I am soooooooooo happy…Hockey Season just around the corner. You might enjoy the engagement. The great thing about recording is you can fast-forward. Has anyone sent Donny a card yet. I did thanking him for being on BB and he was my fan favorite. I have the address copied and will definitely be sending him a “fan letter” and maybe a little something extra cause he should have won more! I did the same Tessa and yes he actually should be the winner.